I think this will definitely be incorporated into the next gen iPhone or a refresh of the iPod Touch. Maybe it is being tested and it will expand to other Apple products. 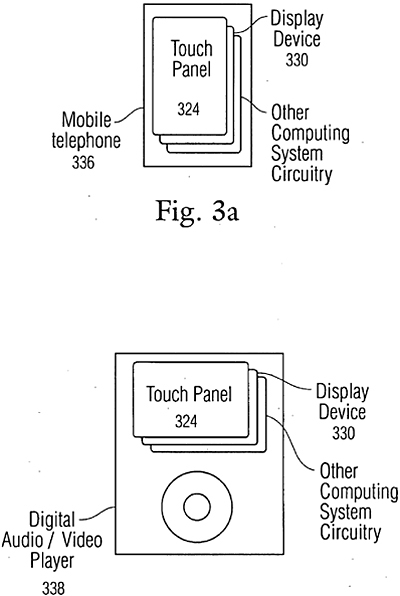 Also looks like this is going to be incorporated into the current iPod line, maybe the Nano first (based on the patent photos). One more thing... I think all the iPods will incorporate some type of touchscreen control. Ummm as for iMacs, Macbooks, Macbook Pros, that's uncertain for now. Waiting continues. Oh no, not plastic. They would be taking a step backwards from the (general) scratch-resistance of glass. Could you imagine what this would cost in terms of price? I think it will certainly bring the cost of the device down. But it also brings the quality down. Hmm. I have the original iPhone so I'm set. Optical glass is not considered hard plastic, it is in fact glass. A glass that is absolutely flawless, completely transparent and can be ground to shape. Well apparently what I read was wrong, lol. I still don't see them replacing the iPhone's screen with plastic though. Maybe future products and iPods, like you said. If it does in fact make it to the next gen iPods, it will make it cheaper to produce (they don't need the wheel or its associated components anymore). I wonder if they will reduce the price as well. Hmm, who knows. I called the touch-screens in another thread in this forum. 5 ******-bag points for me! We can probably expect a plastic screen if the price of the iPhone drops again. But yes, I definitely think it will make it into the next version of the iPod (except Touch).